At eight events, hundreds of people from across the world have had a chance to experience how it feels like to negotiate an ambitious global climate deal using Climate Interactive’s rigorous tools, C-ROADS and World Climate. This is how it happened. 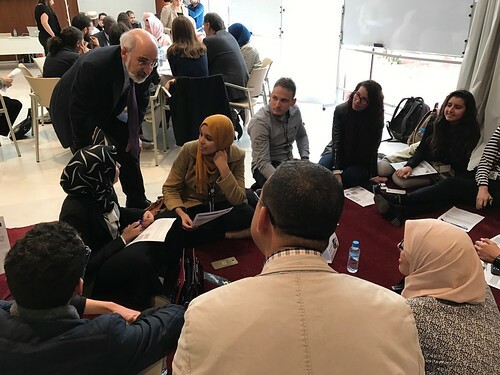 By engaging the business community, Prof. John Sterman was able to challenge the business community in Bengerir and Khouribga to adopt a systems thinking approach in their work. Playing two World Climate simulations here is evident that we are moving into influencing the business community to join in the efforts to transition into a low-carbon and sustainable future. We inspired a movement of young climate activists attending the COP through three World Climate simulations. Two simulations were with young people at the 12th Conference of Youth, facilitated by our World Climate Ambassador, Bindu Bhandari, and Climate Interactive staff Juliette Bohland and Grace Mwaura. 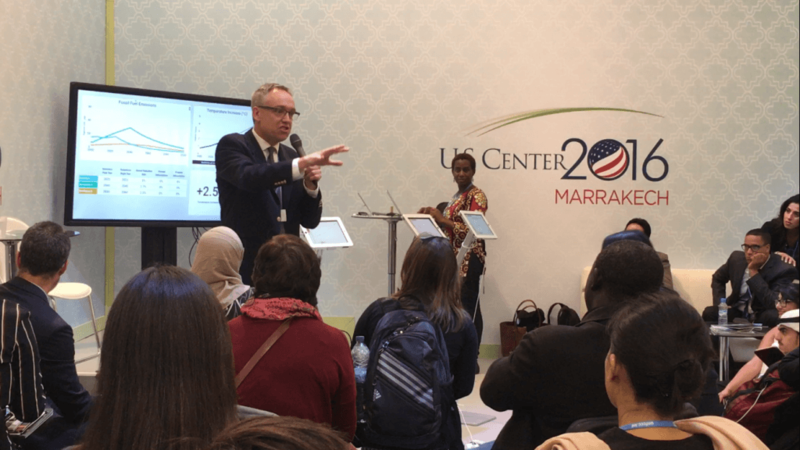 A third simulation, which also included a train-the-trainers session, was held with faculty and students at our partner, University of Mohammed VI Polytechnique, and run by Prof John Sterman, Travis Franck and Juliette Bohland. At our official COP Event on Monday, we shared about our decision maker tools and education initiatives, including the work of our partners MIT Climate CoLab and Abibimman Foundation. The official side-event was well attended by about 50 participants from universities, consulting firms, grassroots organizations, government agencies, and NGOs. We have also run two simulations as official side events at the Green Zone reaching a wide range of civil societies attending the COP. The audio and slides from the event was captured on a UN YouTube channel here. Our highlight has been the Speed World Climates, which Drew Jones has facilitated twice at the U.S. Center allowing groups of about 50 or so to experience World Climate in 25 minutes. 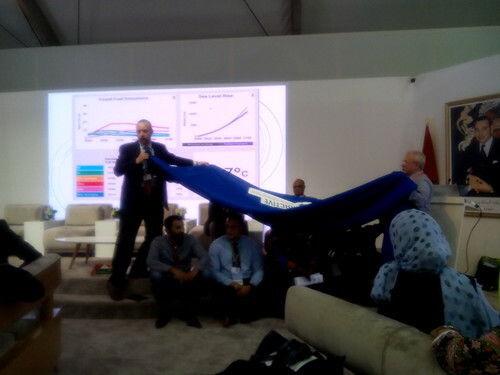 Another speed World Climate was also played at the Monday Side Event, again giving the education and technology community a sense of hope and action. 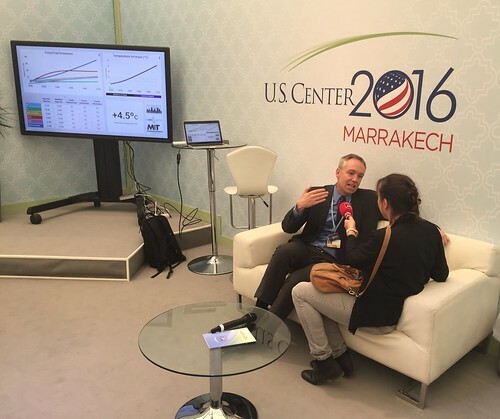 Indeed, 2016 has been an intense year with high mobilization specifically in Africa where with our partner, University of Mohammed VI Polytechnic, we aimed to reach 10,000 people with World Climate simulations. Beyond the COP, the World Climate community did not rest at all. In the last two weeks only, 24 simulations were registered around the world with more than 1500 participants in total. Since the World Climate Week, not only have we witnessed an increasing number of people enthusiastic in using our system dynamics tools, but also, here at the COP, we have met with many others who have been using our free tools for years. We are inspired by these social learning experiences that also enable us to ground hope that indeed the world is moving towards implementing the Paris Agreement and even setting ambitious mid-century strategies. We are now eager to plan how World Climate spans out to more audiences and using innovative approaches around the world.